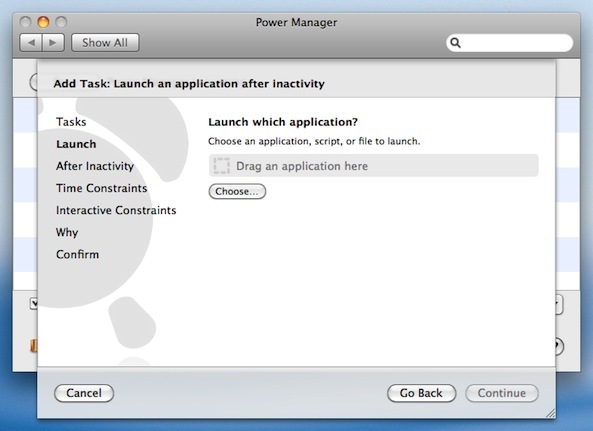 Power Manager can launch applications, documents, and scripts after inactivity. 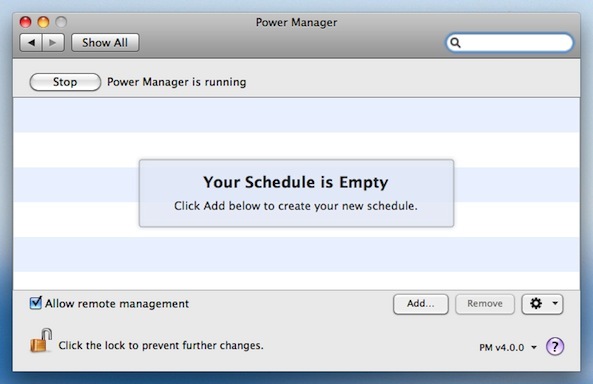 Thanks to improvements in Power Manager's scheduling engine, you can now create multiple inactivity triggered events. Imagine creating an event to warn the user after ten minutes of inactivity, and a second event to automatically log out after twenty minutes of inactivity. This is possible with Power Manager. The Schedule Assistant includes a task to help create events that will launch an application after inactivity. 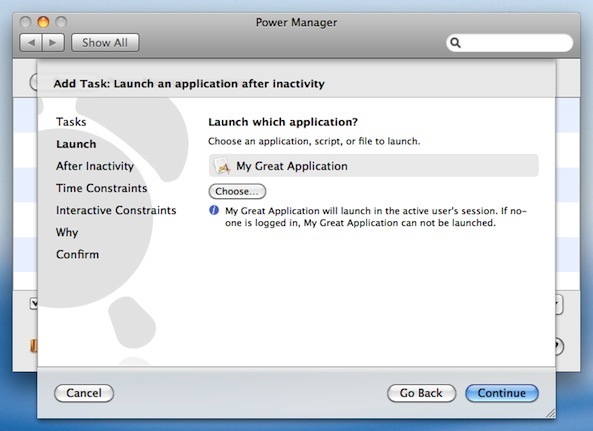 Choose the template "Launch an application after inactivity". Choose the application to launch either by clicking on "Choose…" or by dragging the application onto the gray box.You are not limited to launching applications. You can schedule a document to open, or run a command line tool. To schedule any of these, choose them instead of an application. Click "Continue" to move to the After Inactivity step. Enter the duration of inactivity required before launching. The application is now scheduled and ready to launch after inactivity. The Schedule Assistant has created an event that will launch the application in the front most user's session. 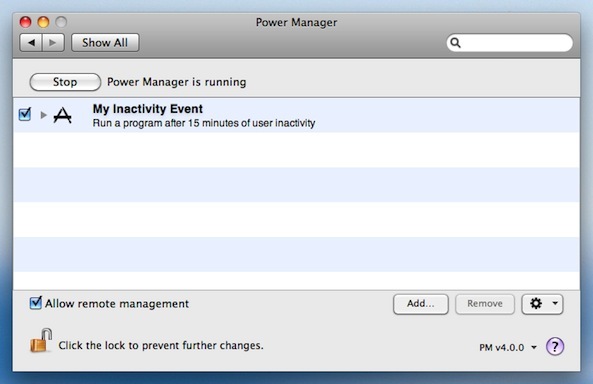 If your application or script causes Mac OS X's inactivity timer to be reset, inactivity triggered events with durations greater than this event can not be performed, because the inactivity time will never climb high enough to trigger the event. 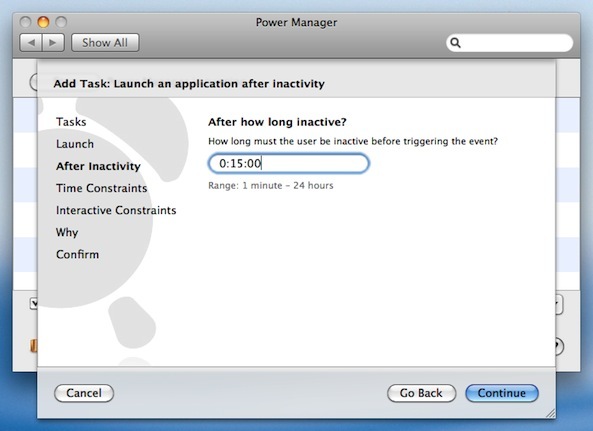 An application can reset Mac OS X's inactivity timer by simulating user actions such as clicking or typing on the keyboard. Some applications do this deliberately to avoid the Mac entering idle sleep. 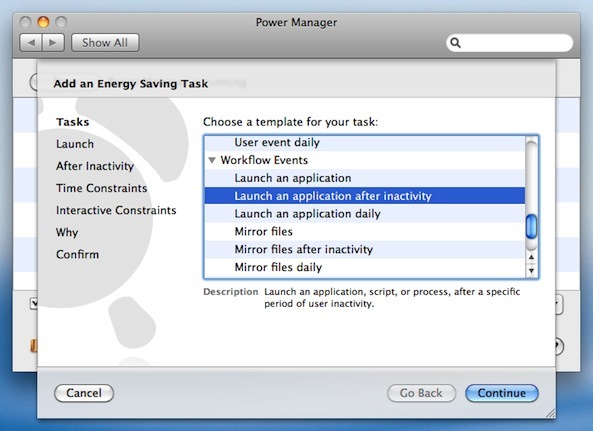 This article was posted in Energy saving, PM4, Power Manager, and Recipe and tagged dssw, how to, inactivity, launch application, launch program, mac, and Power Manager.